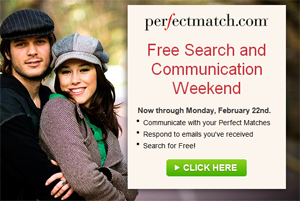 I received an email from Perfectmatch.com advertising a free search and communication weekend starting Friday, February 19th, 2010 to Monday, February 22nd, 2010. Looking on the dating sites homepage though, there is no mention of this promotion. This is a little strange but, I did log into Perfectmatch with my old account and was greeted with a banner advertising the free weekend on the member's homepage. I was also able to communicate with members. So it looks like that this promotion is only available to existing members. Too bad new members couldn't have a go at it. eHarmony was the first dating site to offer this type of free weekend promotion a couple of years ago and just last year Chemistry followed suit. This is the first time I have heard of PerfectMatch doing this. If you are interested in this dating site, you can read our Perfectmatch.com review for more information.